I fell in love for the time at Lake Balaton in Hungary. It was a girl from Berlin, and I met her in a holiday group. I had no idea what triggered this feeling of elation, but it was fantastic. During the day, we saw each other on the beach and in the evenings we sat together and danced at the disco. That summer there was one hit that was really popular. In the daytime you could hear it coming from people's ghetto blasters and at night from the discotheque speakers. It was the reggae song "Kingston Town" by UB40. So, I was completely in love and this song was playing everywhere. Love ended soon after the holidays; I only received one letter from her. But two years later something really amazing happened. Lake Balaton was long forgotten. I was sitting in a bistro when suddenly I was overcome by the same wonderful feeling from that time. I saw her, I saw Lake Balaton, I heard her voice and felt my first kiss again. I wondered what had made me suddenly think of all that again. I looked around and only then did I realize: "Kingston Town" was playing in the background. I'm sure you also know songs which can awake memories and feelings you thought were long forgotten as if at the push of a button. And it still works. I have just put this song on as I am writing, and all those images appear in my mind as I listen to it again. You should immediately try it yourself. Listen to a song which reminds you of the most beautiful and intense moments of your life! An anchor is an impulse (stimulus, trigger) which causes a specific response in someone and which is always the same. In contrast to a reflex, this response is learned and not hereditary. Thus, an anchor is a learned, stimulus-response connection. The basic principle was discovered by the Russian neurophysiologist Ivan Pavlov during his experiments with dogs and has since become known as the concept of classical conditioning. In 1904, Pavlov was awarded the Nobel Prize for his research. Anchors influence our emotional states on an almost non-stop basis. And yet only those anchors which are linked to intense emotional states have a special meaning. They can be both positive and negative. Recognizing negative anchors and replacing them with positive ones if needed is an important step on the way to a better attitude towards life. Anchors can occur in all sensory systems, e.g., the ringing of the phone or a favorite song, holiday photos, specific smells, a certain facial expression, a company logo or motto ("Just do it! "), distinctive voices, movements like the clenching of a fist, words with a particular meaning, places where we have experienced something special, gifts, garments and medals. Make your everyday life easier and improve your customer relationships with the knowledge and use of our natural conditioning mechanisms. Learn to produce beneficial emotional responses in a targeted manner and to break up limiting ones whenever you wish. Anchoring is one of the most fundamental NLP techniques. It makes it possible to selectively produce stimulus-response coupling. This will enable us to store feelings and recall them when needed. An anchor is a stimulus (trigger) that causes a very specific and always the same reaction in a person. Unlike a reflex, however, this particular reaction was learned and is not innate. Thus, an external stimulus, e.g. a particular song, can be linked to an internal state, e.g., feeling of love. Other examples: the ring of a phone or memorable pieces of music, traffic signs or vacation photos, a hot stove, certain smells like freshly baked bread or taste memories, logos, slogans ("Just do it! ", "Simply good" - McDonalds "), unique voices, certain clothes. Anchors affect our emotional states almost non-stop. Special importance, however, is given only to anchors that are associated with intense emotional states. Recognizing one’s anchors and possibly replacing them with more positive ones is an important step on the road to good self-esteem. Deliberate anchoring represents an extension of the concept of classical conditioning according to Pavlov. Pavlov initially noticed by coincidence that the dogs with which he was conducting research already began to salivate merely by hearing the steps of the guard, who always fed them shortly afterwards. Curious, Pavlov always had a bell ring before the dogs were fed, and after a while, the mere ringing of the bell made the dogs' mouths water. We can now use this phenomenon to intentionally anchor desired emotional states with a trigger. Thus, the desired emotional state is retrievable practically on command with the trigger - the anchor. Basically, any sensory impression can be used as an anchor, whether a gesture, touch, image, sound, word or smell. The ability to influence our emotional states is crucial to our lives. On the one hand we can in this way overcome fears and stress. On the other hand, we can generate emotional states such as love and self-confidence in ourselves. Our physical processes play a crucial role in our emotional states. They indicate our internal states. But by changing the physiology, we can also change our states. Anchoring is one of the most fundamental NLP techniques. It makes it possible to selectively produce stimulus-response coupling. This will enable us to store feelings and recall them when needed. By means of this NLP technique, unpleasant anchors can be effectively neutralized. A strong, positive anchor is set and then is fired off simultaneously with the negative anchor. In this anchoring technique, several anchors are fired off one behind the other. This creates a chain of anchors that can lead you from very negative states into very positive states. The ability to influence our emotional states is crucial to our lives. On the one hand we can overcome fears and stress. On the other hand, we can generate emotional states such as love and confidence in ourselves. A state is the sum of all the neurophysiological processes that take place in us at the same time. In other words, NLP describes state as a momentary condition (mood or state of mind) that is expressed in terms of "physiology" and feeling. We experience the world through our sensory organs. The external stimulus, e.g., a sunbeam or the voice of a friend, is transmitted through our nervous system by electrical or chemical signals in our brain. There then arise images, sounds and other sensations. These represent the external stimulus. Our behavior is critically dependent on our state and it is influenced by our internal representations as well as by our physiology, i.e., you can change your state by imagining something else or by changing your physiology. Being in Resource State means that all personal abilities and positive energies are accessible and available, which is usually accompanied by a powerful or joyful feeling. You feel rich in resources. Stuck State means a condition that is perceived as blocked, stressed or uncomfortable. Resources are no longer perceived, or they are experienced as inaccessible. Separator State refers to a neural or emotionally discrete state used to interrupt a current state. Literally translated, this means condition in which one is stuck or held fast. A problem state in which a person is stuck and presents them with a "problem". Problems are often marked by certain triggers, certain anchors. Whenever this anchor is activated (for example, someone is talking very loudly to me), a certain unwanted state will occur (for example, I feel small). A stuck state has a specific physiology. It is usually also physically accompanied by a feeling of rigidity: I feel stiff and not very flexible. NLP's modification techniques aim to positively change stuck states. Physiology refers to everything that has to do with the physical body (as distinct from psychic events). The physiology of a person includes everything that can be observed externally through close perception, especially the entire body language. 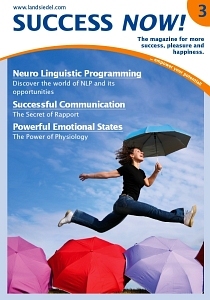 NLP is based on a close connection between body and mind. The physiology of a person has a direct influence on his cognitive processes and on his inner state. Small changes in physiology can have a major impact on your inner state. What all belongs to Physiology? Thies Stahl distinguishes between problem physiology, target physiology, resource physiology and reconciliation physiology as well as various mixed physiologies. This is defined as the state from which the client names what he finds to be problematic, and how he does so detail. A person shows their problem physiology when talking about their problem, remembering a situation (or imagining a situation in the future) that has not turned out to their satisfaction (will result). Problem physiologies can be perceived accurately, but they are different for each person. This is defined as the physiology that my client must demonstrate to me in most NLP modification techniques so that, as a therapist, I know how to tell when the change work is complete. Resource physiology is very similar to target physiology. It is defined as the physiology of the abilities with which my client can get into the target physiology. Respiration, posture, muscle tone, and ideomotor movements will be similar in both states. At the end of the change work, the client should have learned to use the resource physiology himself. Reconciliation physiology is defined as the physiology that accompanies the often very intense experience of the client, when he suddenly knows that the behavior he wants to rid himself of is absolutely meaningful and indispensable to something specific in his life. In the moment in which he can somehow appreciate the function of the behavior in particular contexts, he shows this physiological change. Setting an anchor means consciously linking an external stimulus with an existing experience. All sensory channels can be used for anchoring (pictures, sounds, sensations, smells, tastes). Anchors can be set and released by oneself or by others (self-set, foreign anchors). Firing an anchor means triggering the stimulus, reactivating and experiencing the previously anchored experience. Test: Fire the anchor again. A good anchor has a 1: 1 relationship to the excitation curve. That means, we begin to set the anchor when the excitement is nearing its maximum and increase the pressure (in a kinesthetic anchor) with the increase of excitement. It is important to stop in time so as not to anchor the down curve. In order to install a really strong anchor, the state we have anchored also must have been strong. We do not create a state with an anchor but rather hold it. You can only anchor what's there. If the location of the anchor is not accurately hit when repeating, then the anchor will not work or not at the optimum intensity. If the same anchor is used for different states, the states will mix. If you want to install an anchor that will last for a long time, then it is important to create one that is not constantly overlaid by other experiences in the course of a normal life. So, a handshake is certainly not a good anchor, because it is constantly overlaid by different experiences. When someone remembers a positive state while regretting that this state will quickly come to an end, this wistful feeling will naturally also be anchored. Therefore, make sure that the state you anchor is as "clean" as possible. By means of this NLP technique, unpleasant anchors can be effectively neutralized. A strong positive anchor is used, which is fired simultaneously with the negative anchor. Lead your partner to a state where he has sensations that he feels are inappropriate and unpleasant. If it is completely in the state, anchor this state by touching the knee or touching a knuckle or other harmless area of the body. Separate your client from that state by asking him questions that will lead him to a different, neutral state. For example, ask him where he was last on vacation. Test by re-firing the anchor to see if it works. If not, go back to 1. If yes, go to 2. Lead your client to a state where he had a sensation that he would like to have in the first situation. Anchor this condition to the other knee or ankle. Separate your client again as in 2, but better with other questions. Test the positive anchor by touching the corresponding spot again. Calibrate yourself to the changes your client can not arbitrarily produce. Insure yourself by asking if the anchor is acting strongly enough. If your client has to help with ideas for the anchor to work properly again, it is not installed properly yet. Then go back to 4, otherwise go to 7. Now hold the positive anchor, and then fire the negative. Use the Hypnotalk on the next page. Wait until the physiological changes have calmed down and your client makes a symmetrical, positive impression. If the positive anchor has not been strong enough or should this resource have not been enough, go back to 4 and get an additional resource. Test the merge by asking your client to think about the awkward situation and pay attention to how he responds. If the physiology still contains signs of problem physiology, then back to 4. If not, lead your clients into future similar situations (Future Pace). You can now start to try out new behaviors that correspond with your expectations and needs! ... Isn’t that so? In this anchoring technique, several anchors are fired one after the other. This creates a chain of anchors that can take you from very negative states to very positive states. Determine the target state with the client. Design a chain of states with the client that naturally leads to the target state. Anchor every single state, e.g., on a knuckle. Separate and test each anchor. Fire the first anchor and wait for the physiology to fully develop, then release the anchor and wait about 1-2 sec until you fire the next anchor. Continue to the target state. Take a break for a few minutes. When the client is completely out of state and there is no danger of the last state being chained to the first, then start over. Go through the chain three times. Fire the first anchor and calibrate it yourself to see if the chained process is now running by itself. Example: from hesitating to "go for it!" Ask your partner to find a situation in which he actually knew what he wanted but hesitated. Guide him to this situation (VAKOG) and anchor him on the knuckle of the little finger A1. Increase the pressure as the experience intensifies. Then take your finger away and interrupt the condition ("separator"). Repeat step 1) with "being annoyed" instead of "hesitating". Anchor on the knuckle of the ring finger. A2 - Separator. Repeat step 1) with "impatience". Anchor on the middle finger's knuckle. A3 – Separator. Anchor on the knuckle of the index finger. A4 – Separator. Repeat step 1) with a situation in which there was no stopping him - with a total "go for it" feeling. Anchor on the knuckle of the thumb. A5 - Separator. Do A1 again in "hesitation", then move your finger to A2 and lead him to "being annoyed", then go to A3 with your finger and lead him to "impatience", then on A4 and "unbridled lust", then on to A5 and "go for it!". Repeat step 6) several times faster and faster until A1 leads right to "go for it!". Let your partner find a future situation in which he knows what is best but has hesitated so far. Then ask him to pay attention to how the idea and the feeling of this situation changes when you tap A1 briefly. If "go for it!" does not occur, go back to step 6.